Top filter, used for a few years now instead of OE ones and does just the same job. Half the price of Honda filters and just as good. I have been using these filters for my last two bikes (1250 Bandit and CBF1000) In total the bikes have done over 100K miles with absolutely no problems. I used to fit o/e filters but Honda for instance don't make filters so, technically, their filters are 'aftermarket'. These filters have a good reputation and are around half the price. A no brainer really. Excellent filter product. Used for many years with no problems. And of coarse, the usual excellent service from Sportbike Shop. It's an oil filter, it filters oil. oes exactly what it says on the tin. Nice and easy to fit, stress free. Also, it doesnt have one of those useless bolt-shaped things on the top to round off as soon as you show it a spanner/socket! I've been using these for a while and am entirely happy - great price too! This oil filter is tops for price and quality. I always buy from Sportsbikeshop because of price and speed of delivery. live in northern Ireland which makes you the fastest for delivery in UK. I have used this site for years. No problems - consistent and good value. Never had any issues. Low cost high efficient filter. Works well, seals well, easy to assemble and dismantle. Fast delivery, excellent service. Again and again Sportsbikeshop topshop. Why pay over the odds for an OE Filter when you can get these Hiflo filters at a fraction of the price. Great value and perform just as well as OE stuff. I switched from OE filter for my CB1300 and they are great alternative. I save around £10 each time I change oil and filter and Hi-Flo are really good quality. After 7K, the rubber seal had no cracks and was pretty much alive, I even ripped apart the filter and could see it was doing a really good job. next time I'll stick a magnet on the filter to see what else gets collected in the filter. Easy to fit, simple but good. Brilliant service and postage time again from Sportsbikeshop. ...but makes a wonderful job with oil. Good value from Sportsbikeshop. Thanks. Works fine. Do a lot of miles and never had any issues. Seal always been perfect and never had any problems removing old one. Replacing Honda OEM part, NC750. Ive been using these for a while now, currently for my Triumph Trophy. Good to see the end of the filter sealed with plastic so you know that its clean inside. Quick tip... always pre fill the filter with oil before fitting, even if fitment is on its side, you'll be surprised at the amount of oil it takes. You don't want a delay in oil pressure on first start up. 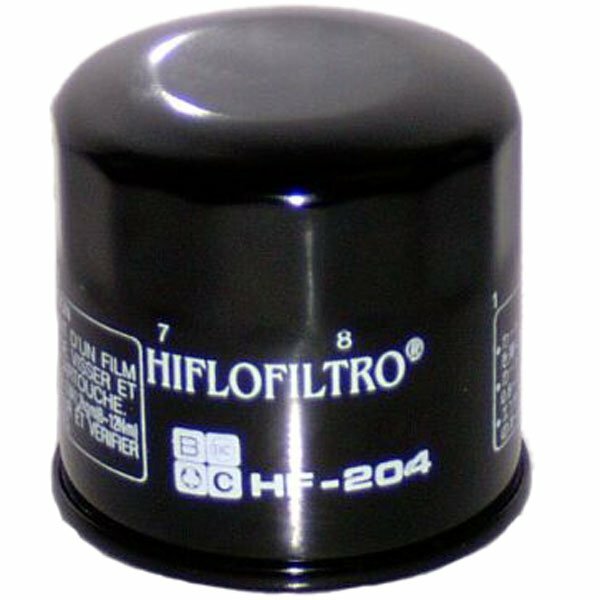 I'm using Hiflo oil filter since I started to service the bike in my own garage. Never disappointed. Good fit, fast delivery. Will use Sportsbikeshop the next time I need this filter. I've used Hiflo before so knew they are a good product, great price and great value. Easy to change and I know it's good for another year. Great quick service from Sportsbikeshop, cheers! Delivered next day, good price, excellent service.